Fall has arrived and all we’re thinking about is cooler temps, spooky movies and the perfect beers to pair with the new season. Luckily, we have two new beers to bring you this month as part of our 4th Annual Freak Week – a week dedicated to the wild and wacky beers coming from Coney Island and the return of Freaktoberfest Big Ol’ Pumpkin Ale. This year will also see the return of Super Freak, an imperial pumpkin ale, as well as the introduction of new new cereal-inspired beers, Count Flocula and Blueberry Boo-liner. We checked in with head brewer Matt McCall to learn about the two newest beers before they go on tap at selection locations for Freak Week from September 17-22! Dessert-themed beers seem to be pretty popular right now, have you tried any sweets-inspired beers that you’ve loved? The first dessert-inspired beer I can remember trying, and still one of my favorites to this day, is Crème Brulee from Southern Tier. It’s a crème brulee inspired stout that has loads of vanilla in it. It’s super sweet and maybe not a beer that you’d want to have more than one of, but it’s delicious nonetheless. Where did the inspiration for Count Flocula and Blueberry Boo-liner come from? Honestly, when thinking of Freak Week my brain automatically went to Halloween. As a kid, nothing was more of a staple in my household than Count Chocula and Booberry cereals. Every year my siblings and I would look forward to getting to enjoy them each morning. The success we had with Cinnamon Toast Kölsch this summer, also helped push my innovation for these beers into the cereal path. 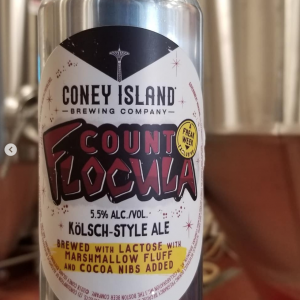 Count Flocula and Blueberry Boo-liner are brewed with Marshmallow Fluff. Has that been done before? I’m sure it has. We had a saying at the homebrew store I used to work at in Pennsylvania, “If you feel like you’re doing something nobody has ever done before, you’re either wrong or doing something that shouldn’t be done.” So given that Fluff is an excellent source for sugar and is also delicious, I’m sure it’s been used in beer before! What effect do you expect the marshmallow to have in each beer? Fluff is essentially 99% sucrose so the yeast will actually attack that sugar source first, eliminating every last drop of sweetness. 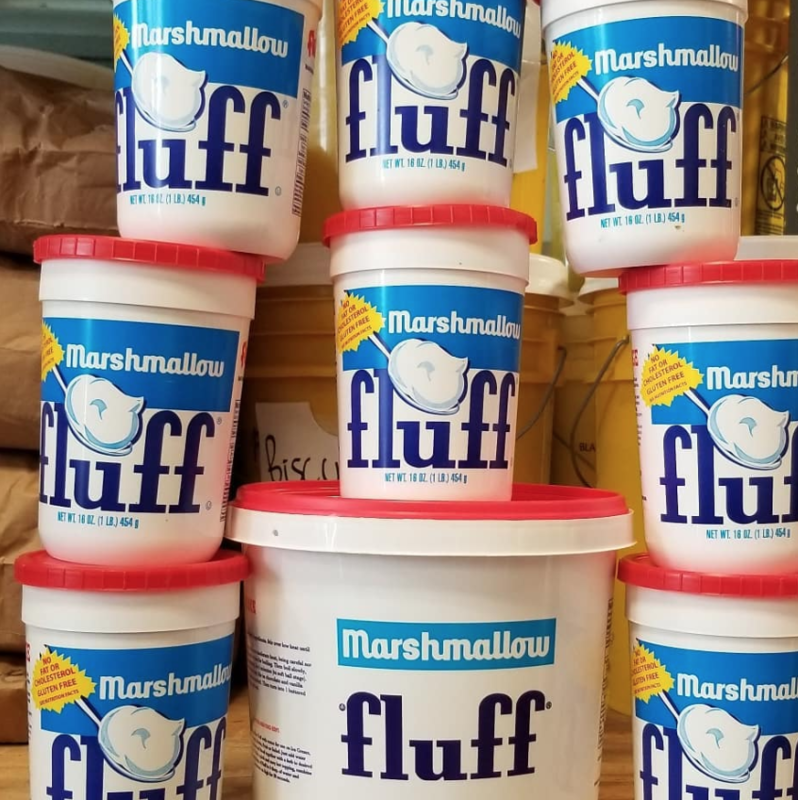 The fluff was actually used to retain some of the Vanilla and “marshmallowy” characteristics in the beer. 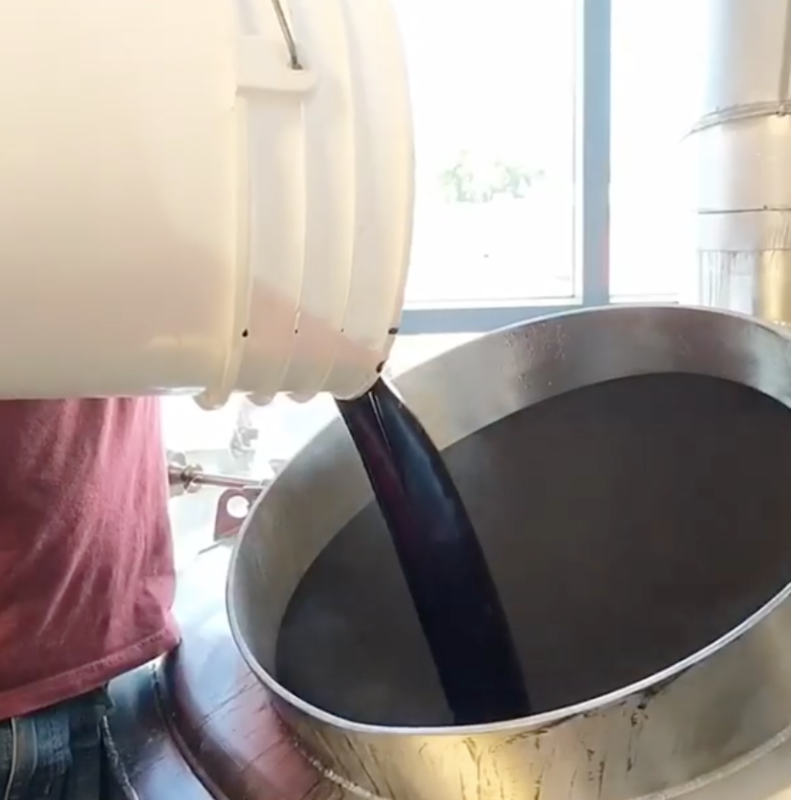 40lbs of blueberry puree going into the kettle sour! What challenges does brewing with sweet ingredients pose? It doesn’t really pose any problems from the brewing side, but it does pose the potential threat of being TOO sweet. That’s where my job comes in to make sure we are using appropriate balance when it comes to sweetness levels, so that people may enjoy more than one. Did you eat a lot of cereal as a kid or are you making up for lost time now in your beer? Oh, I ate a ton! I was the kid who would eat 2-3 bowls every morning. I would never eat the same cereal twice in one day though, so I would have 2-3 unique bowls of cereal every day. I also wasn’t much of a morning person so I would use the boxes to build a “fort” around me and the bowl, so that I couldn’t see my siblings haha. Do you have a favorite from the four Freak Week beers? That’s a bit like asking to pick a favorite child! I think they’re all so different in style that it’s impossible to pick a favorite. I love them all for different reasons but if I HAD to pick a favorite I’d probably say Super Freak just because it’s been fantastic working with Café Grumpy! One of THREE cans that will be available at the brewery 9/22. What’s your favorite fall cliché? Flannel everything. I quite literally have a different flannel for every day of the week. So how can you try these new beers as well as Freaktoberfest and Super Freak? On tap and in six-packs of bottles throughout the NY metro area (and beyond). Check the Beer Finder for exact locations! On tap at select locations throughout Manhattan and Brooklyn. 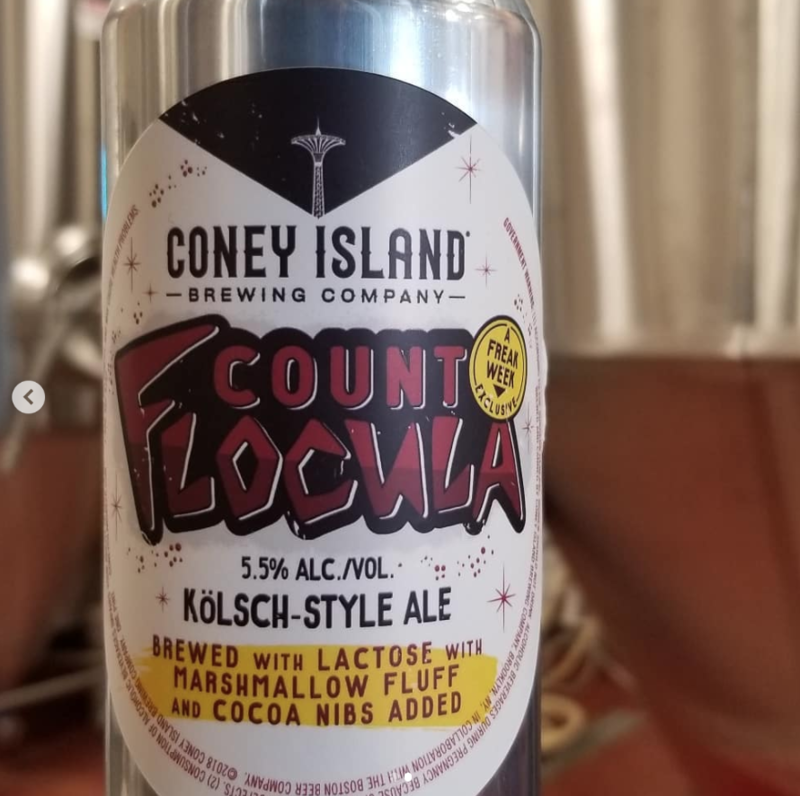 We’ll be doing a can release at the Coney Island Brewery on September 22 during our Freaktoberfest bash! Stillwell turns 100 and Mosaic Underground has arrived! Mermaid Pilsner is On the Move!